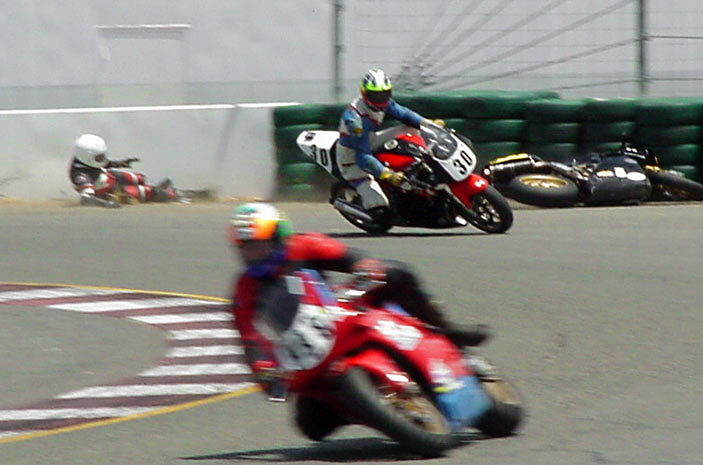 Turn 10 at Sears Point, from May '02 AFM race, 600 Superbike. Ha, I recognize Greg (I think that was his name) the heart surgeon in the back row, second from the left. He was at my first Spencer class, and had already done three or four before that. The guy on the far right of the back row looks familiar too, from another class - maybe John from SoCal, races an R6 and has a HOT girlfriend? Yep, you got both of the correct. But I think John has moved up here to San Jose, he's planning on CCS this season with a formally organized team, I think. And yep, his girl is smok'n. Greg actually went down on the first lap of the first day! Oops. After 20 minutes worth of "if you fall you're out, no matter what" from the coaches.... But they gave him a free pass on that, considering it was like his 5th or 6th time at the school. (I suppose throwing $12k there way makes them a bit more lenient with ya). Good stuff, the Spencer school rocks. I highly recommend it to anyone serious about good coaching. Dohh, first lap on the first day... He was a decent rider when I rode with him (a bit cocky though) - must've been cold tires. 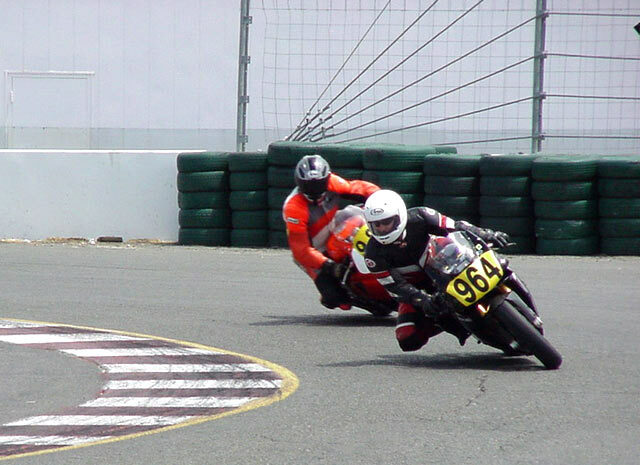 I totally agree on Spencer's school, it's an awesome motocycling experience. Budman, you ARE old school!!! Love it!! you tha man!! Berto and Jeff, great pics!! It's hard to tell with the fast shutter speed of the camera that I actually was carrying 30mph faster corner speed!!! From Ridin' em to "Shootin' em"
Last edited by Dmanrides571; 01-22-2003 at 12:39 PM..
Ok Ok Ok!!!!!!!! ONE more!!!!!!!! Looks like Dmanrides571 got 2 barfers in the last shot. It saves on posts. I think I was about to be overtaken! Here is the bike in new KSJO trimmings. Note the new White boots..they others were fried from the crash. In the pic with me, right?